Users of Microsoft Office that have upgraded to the 2013 version panic when when they click on File==>New and no longer see their customized templates. All they see is a dialog box recommending that they search online for templates. 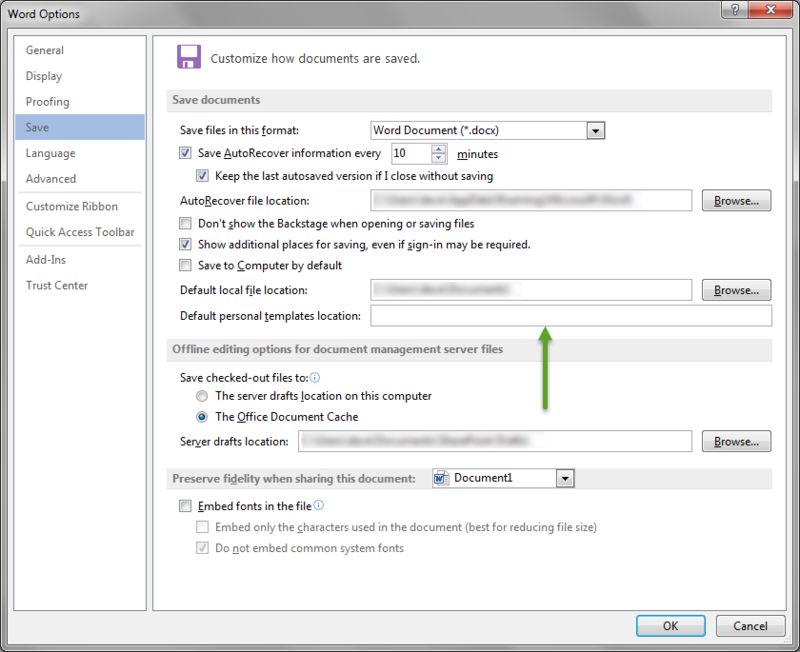 Assuming that you did not actually delete the template files, the templates still exist – Office just needs to be told where the template files are stored. The important setting is the Default personal templates location box. As you can see above, this box is blank. You have to enter the path to your customized templates as shown below. (If you are not sure where your templates are stored, do a search for *.dotx [Word] or *.xltx [Excel].) Click OK to exit the Options dialog box. Note that you have to perform these steps in each Office program for which you have created customized templates. When Microsoft released Office 2007 it replaced the menus and toolbars that everyone knew and loved with the ribbon. According to Microsoft the ribbon was more logical then the menus/toolbars and easier to learn. While that may or may not be true, millions of Office users had learned where the commands were located, at least for those that they used on a regular basis. These people were actually less productive when using Office 2007 because they had to re-learn the command locations. 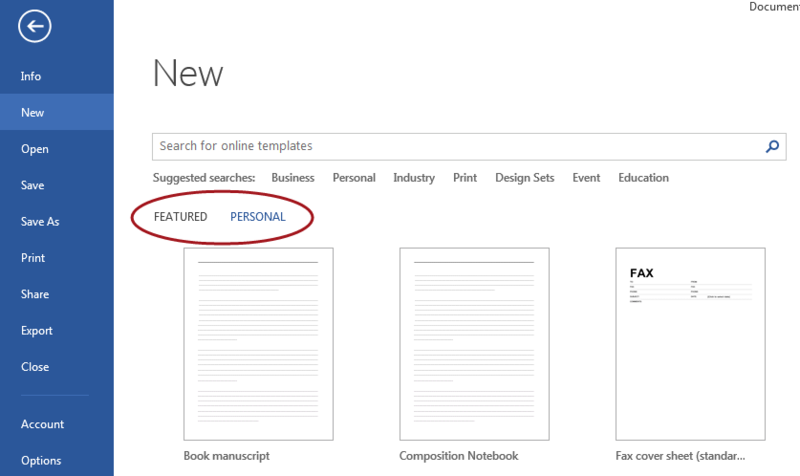 Many people could not figure out how to preview or print a document because Microsoft had removed the File menu and had replaced it with the ‘Microsoft Office Button’. Office 2010/2013 continues with the ribbon, however, Microsoft has mercifully killed the Microsoft Office Button and brought back the File menu, although it is now called ‘Backstage View’. As you can see in the following Excel 2010 example the Backstage View does most of what the old File menu did, along with additional features. Depending on the size of your monitor and the screen resolution, the ribbon in either of these versions takes the equivalent of four or five rows of screen ‘real estate’. To power users who already knew the old menus, this was just another reason for hating the ribbon. What many users do not know is that you can turn the ribbon display off, while the functionality is available at the click of the mouse. 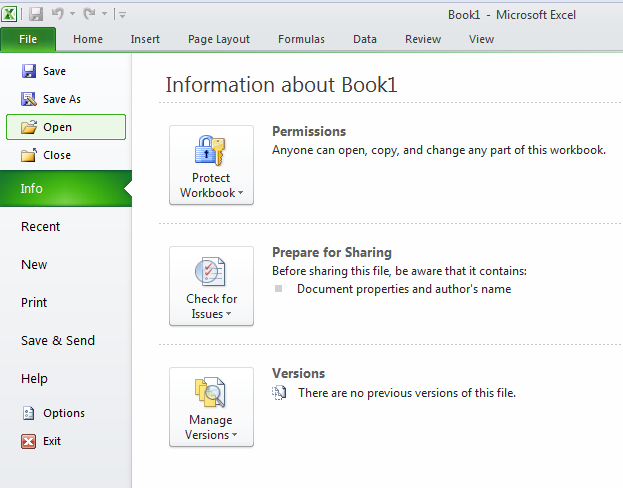 (Although the following sample screen shots are from Excel 2010, the procedure is the same in the other Office programs for the 2013, 2010 and 2007 versions. 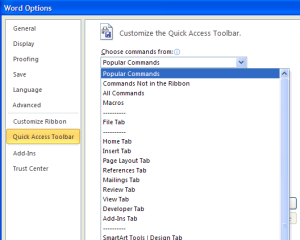 To turn off the display of the ribbon, double-click one of the tab names. The ribbon disappears, with only the tab names remaining. The ribbon is then re-hidden after performing the chosen task. To turn the ribbon display on, double-click one of the tab names. You can also try this tip on any other programs you use that have adopted the ribbon concept. For example, this tip is known to work with the SnagIt 9 and CorpTax programs. 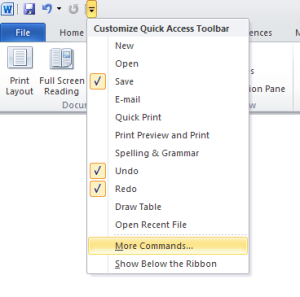 One of the useful features of Office 2010/2013 is the ability to modify the ribbon. By modifying the ribbon you can place the icons for your most used Office commands into a separate (i.e. new) tab, or you can add a group to an existing tab. You can even group the icons in a manner similar to the out-of-the-box ribbon. You also have the ability to stop the display of one or more of the built-in tabs. 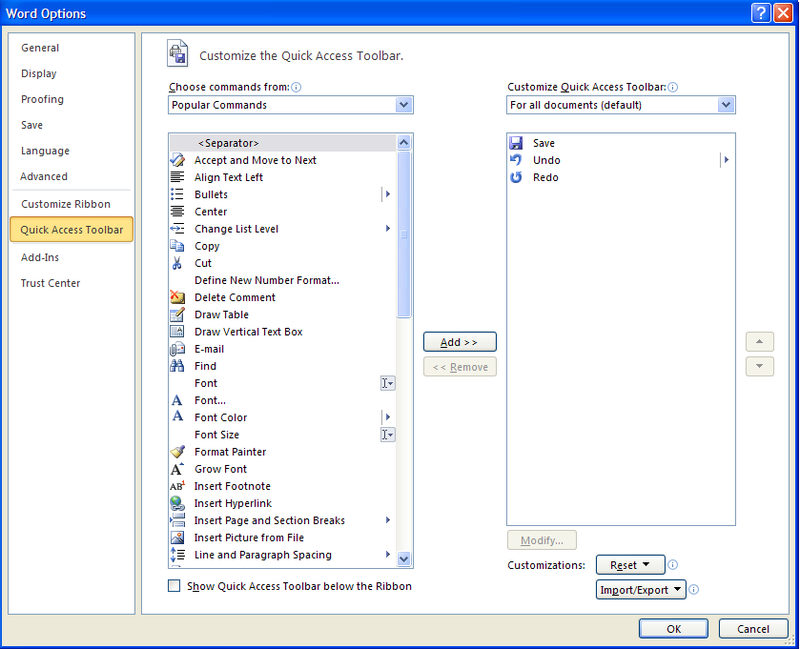 The Quick Access Toolbar (QAT) was Microsoft’s attempt to appease users of Office 2003 for the replacement of the menus/toolbars with the Ribbon that debuted in Office 2007. 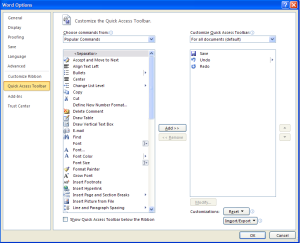 The QAT allowed users to add their favorite command shortcuts to one location rather than having to search the ribbon for commands that were no longer in the expected location. The QAT is the series of icons that are (by default) displayed above the tabs of the Office ribbon. 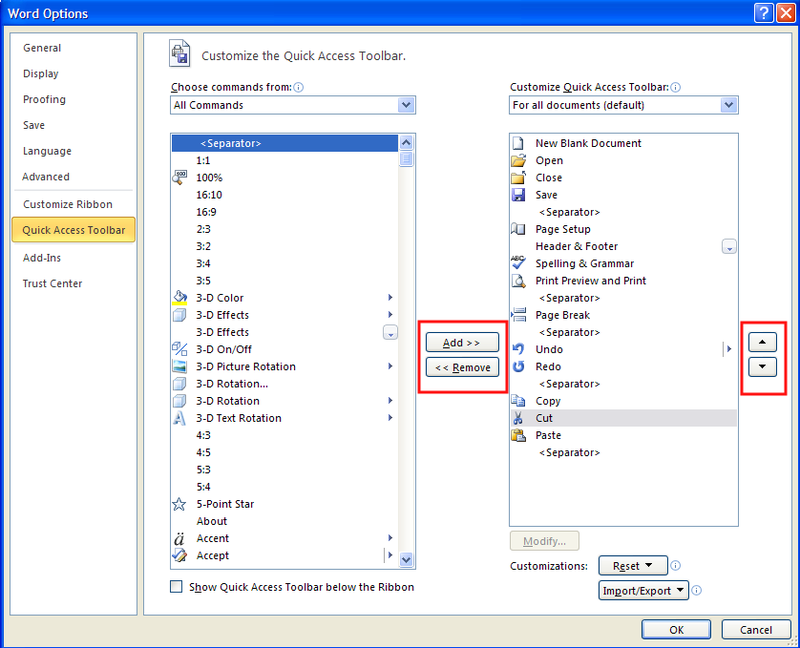 The default QAT for Word 2010 is shown below. To add the commands that you need to the QAT, click the drop-down arrow at the right end of the QAT and select More Commands from the menu. NOTE: Although our example is using Word, the procedure is the same for all Office applications that have the QAT. This will open the Word Options dialog box as seen in the next image. NOTE: this post uses images from Office 2010. 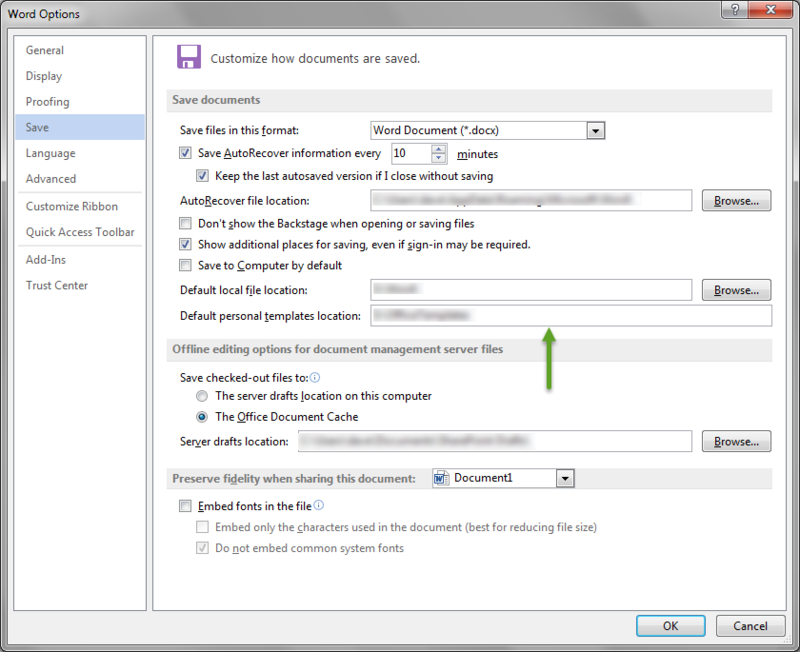 The dialog boxes look slightly different in Office 2007. The left drop-down allows you to narrow the area from which you wish to choose a command. Use All Commands for a comprehensive list. 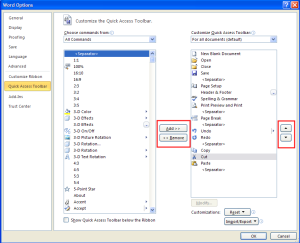 The right drop-down allows you to customize the QAT for all documents, or just the current one. This could be very useful if a document that you use on a regular basis requires special commands. The basic procedure is to select a command from the left pane and move it to the right using the Add >> button. Do not to forget to add the Separator to add vertical bars to the QAT. Use the << Remove button to remove commands from the QAT. The up/down arrows along the right side of the dialog box can be used to arrange the icons left-to-right. The QAT will be look like the following after clicking the OK button on the previous dialog box. You can go through the procedure again to make any additional modifications. You can also erase all of your customizations and start from scratch if you click the Reset button on the options dialog box. Which program(s) do you normally use? Copyright © 2019 - VBA Consultants Ltd.